Last September, when Apple introduced the iPhone XS, iPhone XS Max and iPhone XR, the company announced that it would no longer sell the iPhone SE, iPhone X iPhone 6s and iPhone 6s Plus. In November, amid weak sales of the new models, Apple restarted production of the iPhone X. And now, hoping to clear out its warehouse of unsold units, Apple is bringing back the iPhone SE. Spotted by Mac Rumors, the phones are being offered by Apple in new and unopened boxes. The iPhone SE is available with 32GB of storage for $249, $100 off the price that Apple was selling the model for before it was discontinued. The 128GB model is priced at $299, a $150 haircut from its last official price. The specs remain the same, which means that the device caries a 4-inch display (640 x 1136 resolution), and is powered by the Apple A9 chipset. The handset carries a single 12MP camera in back, and has a front-facing FaceTime camera weighing in at 1.2MP. For the iPhone SE, which was released in 2016, Apple brought back the same design used for the iPhone 5 and iPhone 5s. Apple figured that the device would appeal to those unhappy with the larger screen sizes found on newer handsets, and to be sure, the iPhone SE does have its fans. In fact, rumors circulated last year that Apple was going to produce a sequel, although such a model never appeared. If you don't mind a refurbished model, you can find the 32GB iPhone SE for only $69.99 for Walmart. A new 32GB iPhone SE, also for Straight Talk, is priced at $139. Gazelle has sold out of its stock of refurbished iPhone SE units. Since Apple is looking to get rid of unsold units, we could see the phone remain available from the company until most of the available units are spoken for. More evidence of a confused management at Apple. Their previous modus operandi of contrived obsolescence (with price gouging) backfired and there was no plan B because of their arrogance and complacency. Fortunately for them there are enough fans around to snap these up but it still doesn't solve the problem long-term. Tim cook is going bonkers now. Why not release se2 with dimensions of iphone 8? 4.5" is the standard compact size. That will be next. But really, why not sell them instead of having them set in a warehouse. People need options, we need smaller phones options. We need phones that can be used one hand, in small hands. There is market share for such phones. OEMs are loosing it. 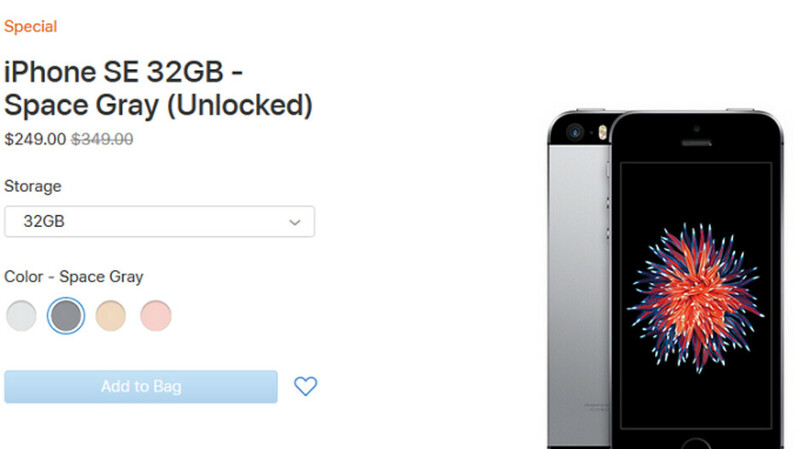 Sell the 128gb model for $250 CAD and I'd definitely buy one. iPhone SE - A phone better than 6 and slightly less than 6S. (Not talking about screen size) - This makes it a 4 year old phone. Apple mostly sold only phones unto 2 generations back. - It has the same A series chip as the 6S. If the currents OS supports all the way back to 5S. The SE should be able to easily support software updates for the next 2 years. - The fact that Apple is selling this means that smaller phone vision has not died yet. - Most of us see this as confusion by Apple but it could easily be that they are experimenting customer reaction to rethink their strategies. Note : Customer is not equal to haters in PA. iPhone SE was/is one of the best phones for people who prefer small sized phones. I would buy it from 3rd party for about $150 rather than $250. Proof that cheap junk phones can come with iOS or Android despite the iSheep around here claiming Android is for poor people while Apple is for the wealthy. Apple is feeling it. This is good, as it will force them to be more competitive, and give the consumers more for the money. All gone already, this was a steal. Wow, not surprised that it is gone. I'm shocked that they did this though to start with!